FriendFeed just announced new themes for users. What’s a social web service without, right? Oddly enough, the selected theme for a given user profile is visible for the profile owner only. Can I choose how my profile or group page looks to other people? At the moment, selecting a theme will change how FriendFeed looks to you, and other people looking at your profile page will see it in whatever theme they’ve chosen. We know how important it is to be able to customize how your profile page or group page looks to the outside world, and while that isn’t part of today’s release, it’s on the roadmap. A little strange. But hey, at least full theme integration is on the roadmap. I took a stab at the CSS only requirement for the themes but didn’t quite make it. Darn. 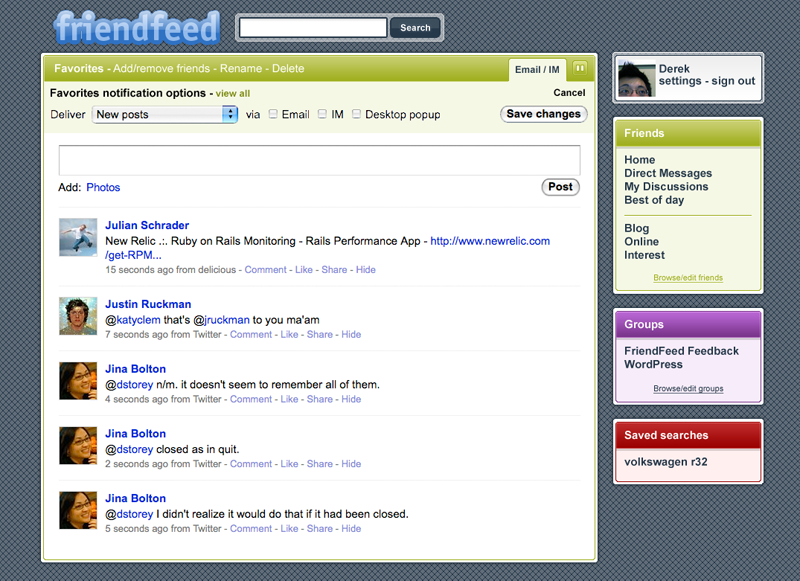 If you are interested in following new theme releases, follow the FriendFeed Themes account. Release custom CSS stylesheet support and that theme directory will really take off.